Form ever follows function. This is the law." American architectural giant Louis Sullivan made it his aesthetic credo, and associated this principle with Modern architecture and 20th century industrial design. 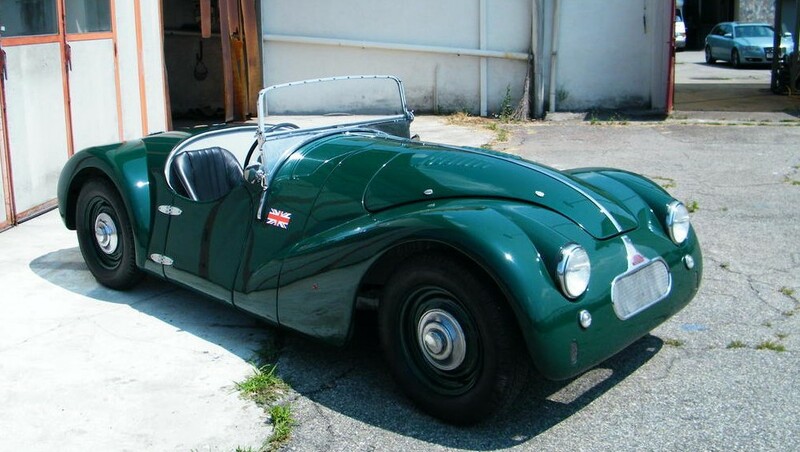 Seems like whomever put the 1954 Connaught L3/SR together was thinking the same thing. From its cycle fenders and pod headlamps to its shopping-cart hubcaps, the Connaught is simply a vehicle made to go fast. Yet its simplicity and rawness are what makes the car so charming. This car underwent a complete restoration at the hands of Jason Wenig's crew at the Creative Workshop in Dania Beach, Florida. When it arrived in the shop, its straightforward metal dash had been replaced with a hunk of lumber, and the Jaeger clocks had been jettisoned in favor of black-faced J.C. Whitney-style units. The instrument panel itself was re-created out of a single sheet of aluminum, to match the rest of the car's stunningly seductive skin. The design and layout of the dashboard came courtesy of a period photograph of the car's interior, which showed the proper location of all the gauges. Contrary to most racing car dash layouts, the massive tachometer isn't front and center in the driver's line of sight. Symmetry seems to have been the most important directive in the way the gauges were laid out. The tachometer is mirrored by a speedometer, which could probably only be read by the passenger. The two big gauges flank a full arsenal of ancillary meters that measure (clockwise) oil pressure, water temperature, amps and fuel. Nestled securely in this cluster is the start button. Straight in front of the driver is an oil temperature gauge, as well as a red light indicating generator charge/no charge. In addition to the gauges, the instrument panel is augmented by a full array of chromed switches, which Jason notes were nearly impossible to find. "The correct switches ended up being WWII-era Spitfire surplus switches," he says. "Even more difficult was that there were two identical styles--one made for the Canadian Air Force, the other for the RAF....We needed the British version with the small Crown insignia in the Bakelite. We found out about the Canada/British thing after we actually sourced a set, and the insignia was Canadian. And remember, there are two pods; we had to find two matching British, WWII airplane surplus switch pods in excellent shape. It was not easy." The 1953 Connaught L3/SR was raced in the United States in the early 1950s, winning its class in the 1951 Watkins Glen Grand Prix. Connaughts were developed and produced by British driver Rodney Clark, and used extensively modified Lea-Francis engines. The Connaught sports/racing car debuted in 1949 at the Silverstone race course, and the first streetable car came a year later in 1950. By 1957, the company had folded.